Eliminate all the video cables, here comes Wireless connectivity between your laptop and television. 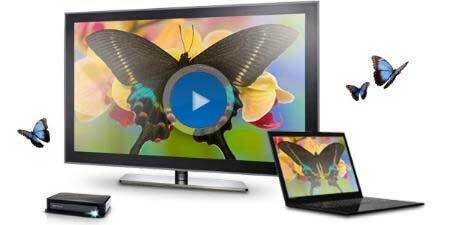 Intel WiDi or Intel Wireless Display is a new technology from Intel that enables you to view your laptop screen on TV without using cables. Intel WiDi can connect laptops with Intel Chipset and Intel Processors to commnunicate with televisions or adapters equipped with Intel WiDi technology. The technology is based on WiFi N series which can operate to transfer High Definition 720p and 1080p content between your laptop and television. The requirements can be quiet long, so be patient to get wireless. Intel HD Graphics works. Investigating whether non Intel graphics like NVidia work. ATI seems to be not supported. It should run Windows 7 32bit or 64bit. Before we go into the Hardware requirements of the TV, let us look at the software installations that are required to support Intel WiDi. Once you have successfully installed the latest drivers and softwares lets move over to the Television side. Connect the adapter to TV just like you would connect the laptop to tv using hdmi. or using the Composite to the HDTV. Intel, Centrino are registered Trademarks of Intel Corporation.